Today I found out the only victim of the Tacoma Narrows, “Galloping Gertie”, bridge collapse was a three legged dog. On November 7, 1940, Coatsworth was attempting to drive across the four month old Tacoma Narrows bridge that at the time was the third longest suspension bridge in the world (today the 33rd longest). He was forced to abandon his car about 450 feet from the East Tower and a total of 1,895 feet from the Toll Plaza because of the extreme motion caused by a wind storm that had winds as high as 42 mph (69 km/h). Three people attempted to save the dog, Coatsworth himself (no doubt thinking of the lashing he’d get when he got home and told his wife he’d abandoned her dog), a friend of his, Howard Clifford, and finally a man on the scene, University of Washington Engineering Professor F.B. Farquharson, who had arrived to observe the bridge’s motion. In all cases, they were unsuccessful. However, in the the case of the brave professor, he actually managed to get to the car and even to get near the dog. But, as you might imagine, Tubby was in no state to let some random person pick him up and remove him from the car. As such, when the Professor opened the car door and attempted to grab the dog, Tubby snapped at him, managing to bite the index finger of the hand that was trying to save him. Unable to secure the dog without bodily harm, Farquaharson left the car and the dog, returning to safety. None too soon either as a few minutes after Farquharson returned from his dangerous walk to save the dog, the bridge collapsed, sending the car and Tubby to a 200 ft fall into the Tacoma Narrows, which at that location had a depth of about 125 ft.
Six months later, Coatsworth was awarded $450 for the loss of his car and $364.40 for the contents of his vehicle for a total of $814.40 (about $13,000 today). The fact that we have video footage of the bridge collapse is thanks to Barney Elliott, who owned a nearby camera shop and recorded the event on 16 mm film. It takes an average of about 10 years to re-paint the entire Tacoma Narrows bridge from end to end, although repainting only happens in the summer months. While in retrospect Gertie was a spectacular failure from an engineering standpoint, it was designed and built soundly based on the state of suspension bridge engineering knowledge of the day. Contrary to popular belief, and even what you’ll occasionally read in some older textbooks, Galloping Gertie did not collapse because of “elementary forced resonance with the wind providing an external periodic frequency that matched the natural structural frequency”. In fact, it collapsed because of aeroelastic flutter. In layman’s terms, this is where wind over deformations in or against an object can cause further deformation if it’s powerful enough to overcome the rigidity of the object. These further deformations then can cause even greater deformations if the wind keeps up, escalating until the structure breaks or the forces against it die down. This can be commonly seen with airplane wings at speeds over the wing’s rating or more commonly in flags flapping back and forth as they blow in the wind. You may have even observed it with things like Stop signs fluttering in strong winds. Thus, with the Tacoma Narrows bridge, the wind blowing on the sides of the bridge couldn’t pass through the deck, which caught the wind. With high enough winds, this overcame the rigidity of the bridge and caused it to flex somewhat. This further flexing helped the bridge catch the wind even better, which caused it to flex even more. This escalated to the point where the structure could no longer support the flutter and it collapsed. As you might expect, this collapse caused a huge surge in research into aerodynamics/aeroelastics. Indeed, as they weren’t exactly sure of all the forces that had brought down Gertie, for the first time ever, the newly designed bridge was tested in a wind tunnel by none other than Professor F.B. Farquharson who had attempted to rescue the dog. They were able to test scale models and sections of the new bridge design up to 100 ft long in this special wind tunnel. Many of their design modifications to account for the wind were adopted by nearly all suspension bridges built after. Although it had been designed and thoroughly tested by 1945, the bridge that replaced Galloping Gertie was not completed until just under a decade after Gertie collapsed. This was due to WWII creating shortages in some of the needed materials. The new Tacoma Narrows bridge opened up on October 14, 1950. This replacement Narrows bridge cost $8.5 million (about $80 million today). In contrast, the second Tacoma Narrows bridge built in 2007 cost $735 million for the bridge itself (about $800 million today, so about 10 times what the original cost, even accounting for inflation). In addition to the 2007 bridge, there were also another $583 million in road improvements to accommodate the new bridge. 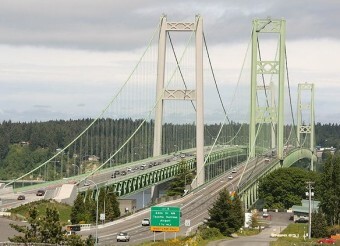 The 1950 Tacoma Narrows bridge has stood since then with no problems and even exceeded its design capacity. 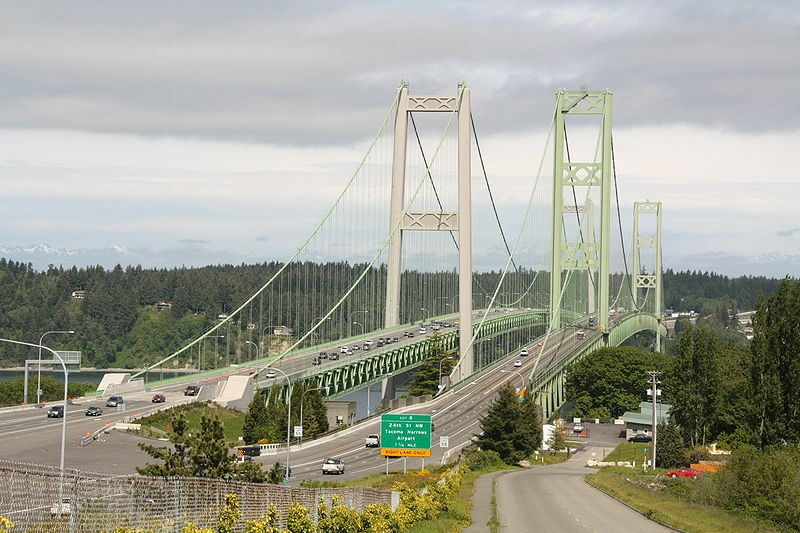 It was originally designed to handle just 60,000 cars per day, but at its peak before the 2007 second Narrows bridge was opened, the 1950 Tacoma Narrows bridge was handling 90,000 cars per day. Today, it only handles westbound traffic with the new bridge handling east bound traffic. The remains of Galloping Gertie are registered as a “Historic Place” and is one of the world’s largest man-made reefs. Among other sea-life, Gertie’s remains are home to the Giant Pacific Octopus, which is one of the largest Octopuses in the world weighing in at about 150-ish pounds with arm length as long as 14 ft. The toll price on the 1950 Narrows bridge was initially 50 cents per car/driver (about $4.60 today) and 10 cents per passenger (about 92 cents today). This is more or less the same price as tolls on the new bridge (at $4-$6 depending on how you pay). Because of rapid increases in traffic over the original Narrows, they were able to stop tolls on the 1950 bridge 13 years ahead of schedule after raising $19 million through about 15 years of tolling. The Tacoma Narrows (the strait itself) was named “Narrows” by Charles Wilkes in 1841 during a government sponsored exploratory expedition. One of the chief designers of Galloping Gertie, Clark Eldridge, was captured by the Japanese about one year after the collapse of Gertie and spent almost four years in a Japanese POW camp before being released. Proof-reading as well as spellcheck! I really liked this article! I have never read anything on the poor puppy that died. Though, I’m not a grammar Nazi or anything, I think u did wonderfully and I will subscribe! God bless! Poor dog perhaps….but then again, silly dog for not being aware of what was going on! Thank goodness the attempted rescuer was safe.